George C. Crossan was born on May 1st, 1920 during a late spring Colorado blizzard in a ranch house near Toponas. This should have told everyone that he was a survivor. 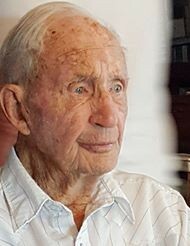 He was 98 at his passing on July 29, 2018. He survived the depression and World War II, where he served in Europe as a Sargent in the Signal Corp. George was preceded in death by his parents Robert and Florence, sisters, his wife of 48 years Billie. He is survived by his three children, Melvin (Donna), Charles (Pamela) and Carol Loeffler (John), 10 grandchildren, several great and great great grandchildren, and 20 year companion Beth Teal. George loved golfing as a “Happy Hacker”. Grave side services will be held in Yampa on August 4th 11 AM and memorial services in Granby, 4:00 PM at St John the Baptist Episcopal church.